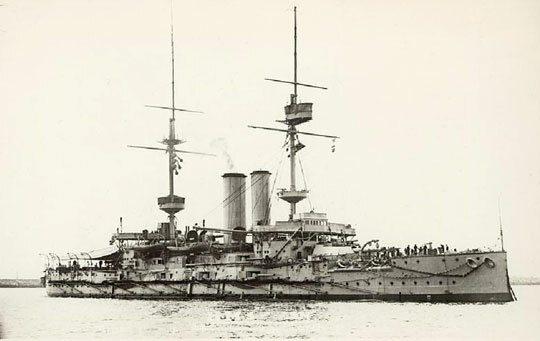 There were two ships built in Devonport with the name HMS Ocean; the first launched March 1863, the second in July 1898. A print from the Illustrated London News 1863 Vol XLII. 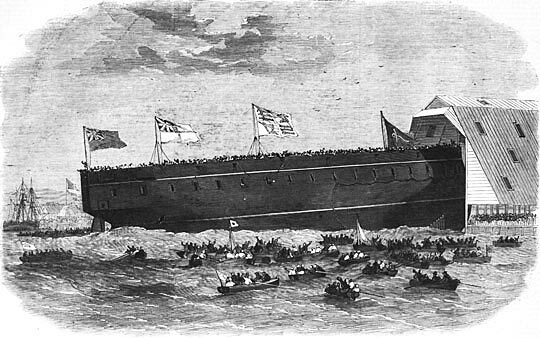 entitled: 'Launch of Her Majesty's Iron Clad Frigate Ocean at Devonport'. The launch was carried out by Mrs Mary Symonds, wife of Admiral TCM Symonds CB, who was then Superintendent of Devonport Dockyard. Following launch it was another three years before commission in July 1866, the final cost being £298,851. The ship only operated for six years as she was decommissioned in June 1872, then sold for scrap in 1882. 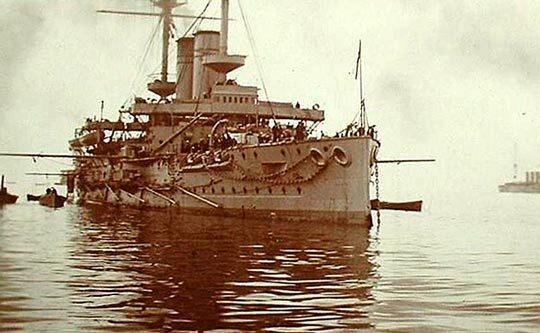 HMS Ocean was built during a transitional period of warship design, when the Royal Navy was leaving sail behind, preferring what was then the more modern method of steam. 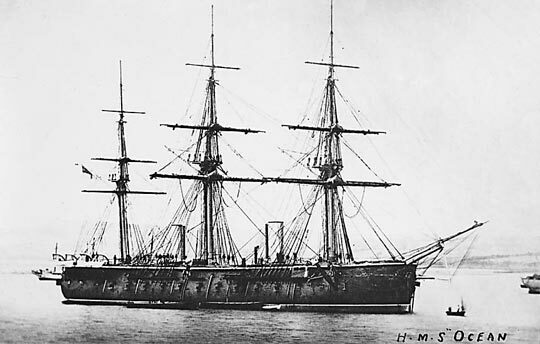 She was laid down in 1860 as 100 gun conventional sailing ship of the line but her design altered during the course of build; she subsequently became a 35 gun ironclad steam frigate while at the same time maintaining full sailing capabilities. Ocean became the only armoured British warship to round the Cape of Good Hope under sail. A postcard of the iron-clad steam frigate Ocean, complete with rigging for sails. During WWII Ocean was sent to the Dardanelle's in February 1915, a month later she was hit first by gunfire then by a floating mine; the ship was abandoned and she sunk a few hours later. Although not built here the 1995 Ocean is mentioned since she was commissioned here, on 30 September 1998, and HMNB Devonport is her home port. She was built by Vickers Shipbuilding and Engineering Ltd of Govan as an amphibious assault ship, providing a landing platform for helicopters. She is the only one in her class, plus she is also Britain's biggest warship. Early in 2010 a number of cuts to the surface fleet was announced, including the possible scrapping of HMS Ocean. In Dec 2010 the Ministry of Defence decided to keep Ocean in service, in order to provide Landing Platform Helicopter capability for the longer term and to help address the legacy of unaffordability in the Defence budget.